Planning a Maui wedding? Borrow these practical tips from another Maui bride! An extravagant Maui wedding knows few boundaries. Learn how today's brides & grooms tie the knot in style. Most couples coming to Maui for their Maui wedding bring their wedding rings with them. Here's some excellent advice for the groom on what to consider when selecting his Maui wedding band. Your Maui Wedding . 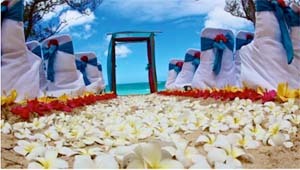 . . . .
Providing beautiful beach weddings on all the islands of Hawaii with full event coordination and receptions. Mary Sloan is a passionate photographer who strives to capture the full story of your wedding, family portrait, and the beauty of Maui. Mary has a long history in the photography field, and also works with many of the high end Real Estate publications such as Home and Land. Mary's diversity can cover just about any photographic need you may have and she will give more than what is expected, and is very passionate about creating those special photos that become your memories of a lifetime. Please also check out her website, for more information and her portfolio. Mahalo for your time. Oceanfront vacation rental home on a 5 acre estate with 3bdr/2 bath. Perfect for windsurfers/kiters, vacation families. Tropical gardens and everything you want. Weddings okay.